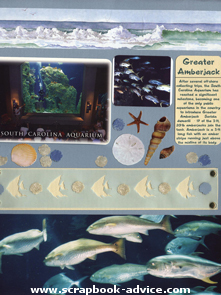 These Aquarium Scrapbook Layouts below are all from the South Carolina Aquarium located in Charleston, South Carolina. They depict almost every gallery at the Aquarium and most of the journaling is taken directly from the information provided at the Aquarium. 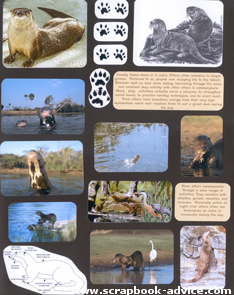 All of the layouts in this album were 12 x 15 inch pages, so there are many uses of photos developed in Panoramic format, 4 inches x 12 inches. I used these large photos quite often to take up the extra 3 inches at the top or the bottom of the page so that I could still use the traditional 12 x 12 scrapbook paper. In some cases, I pieced together paper and card stock to cover that extra space so you may see some piecing involved on some of the pages. Fortunately, the piecing does not show as much in real life. 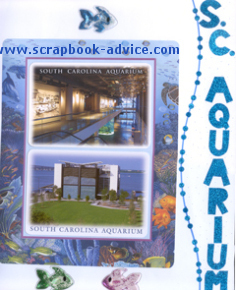 These two S C Aquarium Layouts above represent the title pages for the entire SC Aquarium Scrapbook Album. The Title letters were hand cut from some aqua blue metallic paper with adhesive on the back that I found in my stash, purchased years ago from QVC in a bundle of unusual papers. 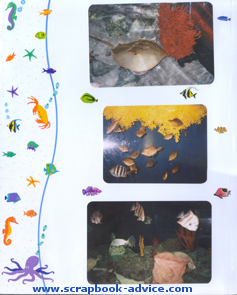 The 2 photos on this page were actually post cards purchased at the Aquarium Gift Shop mounted on top of a fish design printed on an 8 1/2 x 11 sheet. The fish were liquid and glitter filled embellishments purchased at A. C. Moore several years ago. 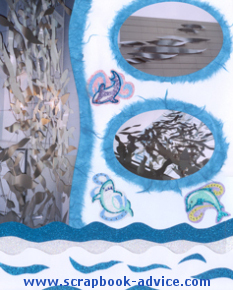 The photos on the right side are metallic art work representing sea life and can be found on the outside of the building and covering the ceiling of the Great Hall just inside the building. Mattes are made from Aqua Mulberry Paper torn in the shape of the photos. Embellishments are glittered stickers found at the Aquarium Gift Shop. 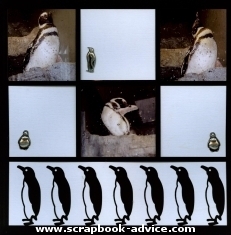 These two Aquarium Scrapbook Layouts show the Penguins from the new exhibit. The basis for this was a plain light blue background with a Black Die Cut from Dillon's Laser Designs that I picked up at the Scrapbook Expo in Atlanta July 2009. I had the Penguins going in one direction for the left page and turned over the Die Cut page to have them waling in the other direction for the right page. 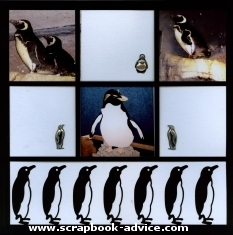 Aside from cropping the photos of Penguins to fit behind the laser cut squares, I used some Large Metal Penguin Brads that look like Pewter. I picked these up from Scrap Your Trip.com. They are each about 1 to 1 & 1/4 inch high in 2 designs. To see more of Dillon's Laser Cuts see our page on Die Cut Kits. 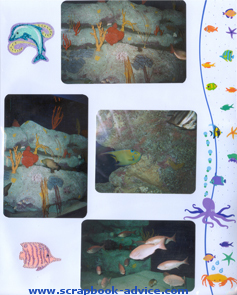 These next layouts in the SC Aquarium Scrapbook show various and colorful fish in the Great Ocean Tank are done on the white background paper. Borders were hand drawn with a curved edge ruler and a wide point marker pen. Various fish and sea life stickers were used on the border and a marker pen dotted the white space from the border the edge of the paper. 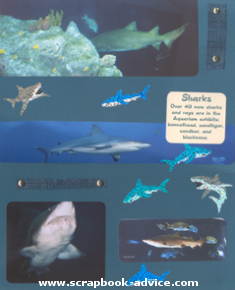 The Aquarium Scrapbook Layout pages of the Sharks use a number of photos and post cards of various sizes. Background papers are Club Scrap "By the Sea" kit. The dark teal Coastal Netting was from Magic Scraps and is attached with gold brads. The Glittered Shark stickers were purchased at the Aquarium Gift Shop. Journaling was done from the information provided from the tour and was done on the computer in the same font as the letter squares. 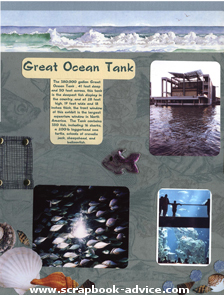 The SC Aquarium Scrapbook Tidal Creek layouts uses 2 post cards as well, letter squares and paper from Club Scrap "By the Sea" kit. 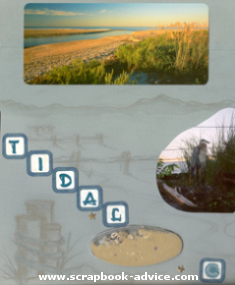 The embellishment under the word "Tidal" is a shaker box with very tiny shells and actual beach sand. Both the shells and the sand were purchased from Magic Scraps. 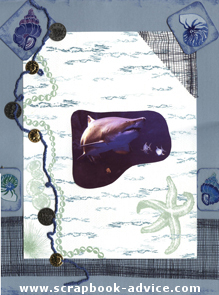 The Aquarium Scrapbook Layouts of the Salt Marsh area use background paper from the Club Scrap "By the Sea" kit as well as the letter squares for the title. The letter squares are glued to small squares of coordinating paper to make them easier to align. 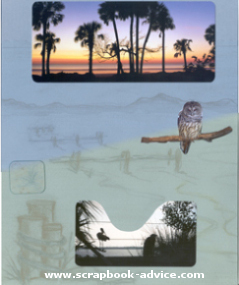 As I was getting these pages ready to scan, I discovered that I had some journaling still on a post-it note that goes on the left hand page to tell about the Snowy Egret. I have cropped the two photos on the left to remove signs that were prominent in the photos. 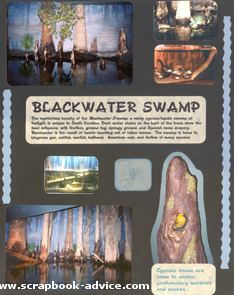 The S C Aquarium Layouts about the Brown-water and Black-water Swamp exhibits are very interesting and these Aquarium Scrapbook Layouts tell the story through 2 large journaling blocks. 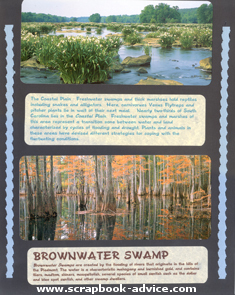 The journaling describes why the water is the color it is and the large number of swamp and coastal plain inhabitants and is done in the same computer font as the rest of the Album. Post cards were purchased to use for the photos on the left. 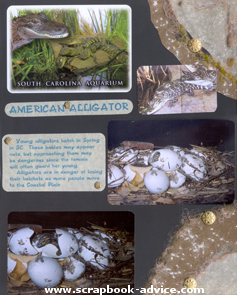 The SC Aquarium Scrapbook Coastal Plain and American Alligator scrapbook layouts represent two additional galleries in the South Carolina Aquarium. Embellishments of turtle stickers and gold sand dollar brads are mixed with page corners of sandy textured papers and brown fibers. Again, Titling is done in the letter squares from the Club Scrap "By the Sea" monthly kit and the computer journaling is done in the same font and printed on an ivory vellum attached with gold scallop shell brads. 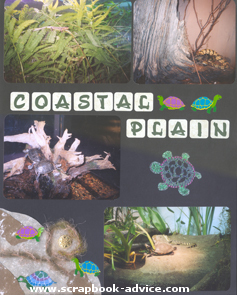 I used my photos, in addition to a post card and an few small photos from the Aquarium brochure. 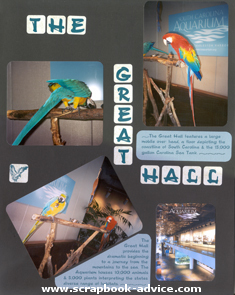 These Aquarium Scrapbook Layouts above are of the Great Hall just inside the Aquarium and the 15,000 gallon Coral Tank as well as the floor of the hall which is a replica of the South Carolina coastline and two very popular Parrots who inhabit the Great Hall. The Great Hall is the beginning of the journey through the South Carolina Aquarium which provides the visitor a view of all aspects of South Carolina wild and sea life from "the Mountains to the Sea". Journaling and Titling are both done in the font that came with the Club Scrap "By the Sea" kit. 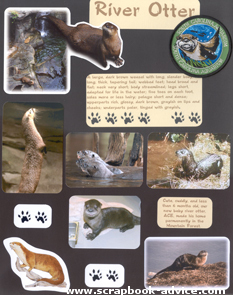 The River Otters were spectacular, but so fast that there were very difficult to photograph, so this layout involved several trips to the aquarium and purchasing post cards, the patch, and photos and as you can see reproductions of their paw prints. The journaling was done from the information provide on the backs of the post cards and from other information learned at the exhibit. 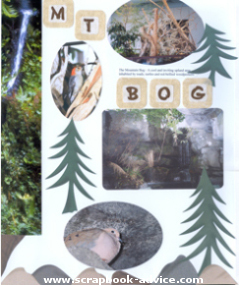 These Aquarium Scrapbook Layouts of the Mountain Bog & Mountain Forest, represent the North Western part of South Carolina along the eastern flank of the Blue Ridge Mountains. 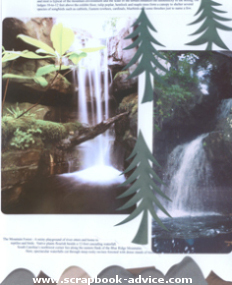 This part of the state has the wonderful waterfalls, rocky areas at the foot of the mountains and tall pines all of which are represented in this layout with die cuts and panoramic photos. The Great Ocean Tank! For these S C Aquarium Layouts, I used a lot of stickers of fish and shells. Across the top of both is a border strip of the waves coming into the beach. 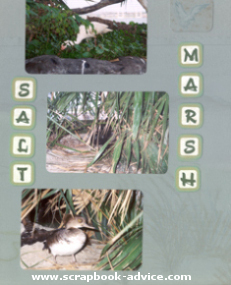 The journaling is taken directly from the information provided at the Aquarium. It is done on the computer in the same font as the rest of the album. 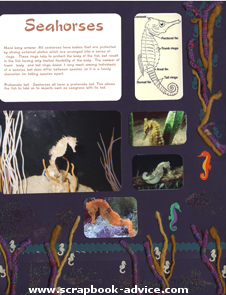 The Seahorses Aquarium Scrapbook Layout was a difficult one to do as the Seahorses were very hard to photograph. The tank they were in was round and the camera just couldn't get good photos. After trying with 5 different cameras, I finally ended up with some small cropped photos. In my research about the Seahorses, I learned that the males carry the babies. On the right page, I used a Seahorse die cut from my local Scrapbook Store and used several small Seahorse punches of a contrasting color on the larger die cut. 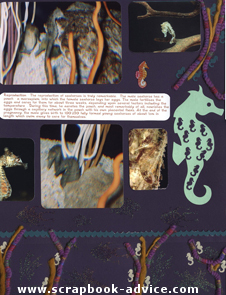 Also on these layouts are a number of fibers to resemble the seaweed in the photos in purple, green and gold with more seahorse punches intermingled. 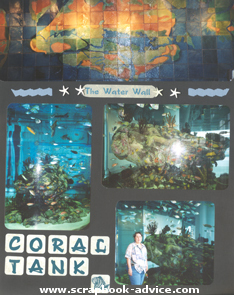 These two Aquarium Scrapbook Layouts above both showcase individual photos. 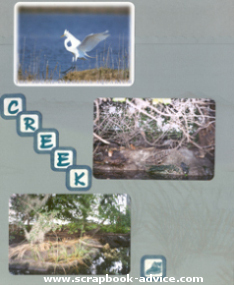 These photos are not mine, but were the cover photos on the Aquarium Newsletter called Tributaries. 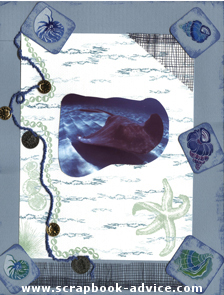 They were such good representations of the Stingray and the Shark, I decided to include them in my scrapbook. Each page has a patterned 8 & 1/2 x 11 sheet in the center of the larger solid color background sheet. Since the photos were relatively small, lots of embellishments were used. Embellishments include the fiber with the old coin replicas, resembling buried treasure finds from Club Scrap and the Coastal Netting from Magic Scrap. The Tags were made from left over pieces of the background card stock, with colorful stickers of ocean creatures and inked edges. This page is actually the cover page to my album. What is it? 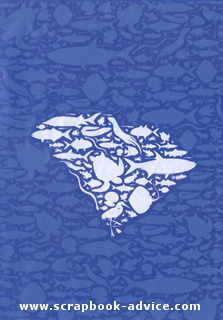 besides an interesting collage of fish silhouettes in the shape of the State of South Carolina? Well, I must confess, it is the design on the shopping bag that you get when you purchase items at the Aquarium store! 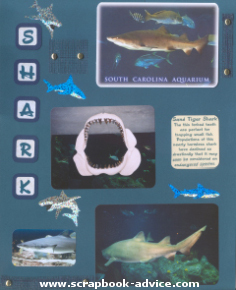 I just couldn't let it go to waste, so it now adorns the cover of my South Carolina Aquarium Scrapbook Layouts Album! and Happy Collecting things to use on your layouts.